Book multiple events and save! Multipack discounts apply to most events, however allocations are limited and only apply to full price A Reserve or General Admission tickets. Premium tickets can be included in your Multipack but will not be discounted. Once an event's Multipack allocation has been exhausted, you can still add that event to your Multipack to reach three or more events, but no discount will apply to that event. Events in black are eligible for a discount, events in grey can be included but are no longer eligible for a discount. Events in white are not currently available. Multipack discounts are not available on: Monroe & Associates, events $20 and under or any paid workshops. Browse the program and add items to your multipack from the event pages or go directly to the multipack builder and drag and drop the events from the full list. 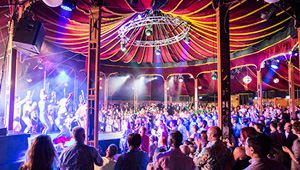 If you would prefer to book your tickets over the phone, you can call Sydney Festival's ticketing line on 1300 856 876. You must book all events in the one transaction in order to qualify for your multipack discount; prior purchases do not count.